Gorgeous and modern Marbella villa situated in the famous area La Cerquilla in Nueva Andalucía. Features a private tennis court and swimming. Fantastic Marbella villa in two levels with high specific features and quality. Separate TV room and one double bedroom, on the same level a large open kitchen with dining and living area. Upstairs are three double bedrooms and a bedroom with two single beds. The apartment Villa Blue is located in Marbella area. Located at La Cerquilla, the most prestigious area in Nueva Andalucía and one of the most exclusive developments of the Costa del Sol. Nikki Beach - 0.00 km. Beaches Marbella - 0.00 km. 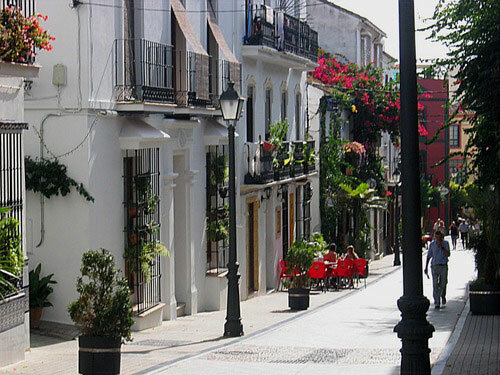 The Old Town Marbella - 0.15 km. Impressive villa with amazing south facing views over the valley and the Mediterranean Sea.